The introduction to the “Lectionary for Mass” outlines the rationale for the readings appointed to be read at Mass in the Ordinary Form of the Roman Rite. It notes, “[A]fter the Sixteenth Sunday in Year B, five readings are incorporated from John chapter 6 (the discourse on the bread of life). This is the natural place for these readings because the multiplication of the loaves from the Gospel of John takes the place of the same account in Mark.” Following typical Johannine practice, the Gospel narrates an event (“sign”) performed by Jesus, which, in turn, instigates a lengthy discourse on the meaning of that event/sign. 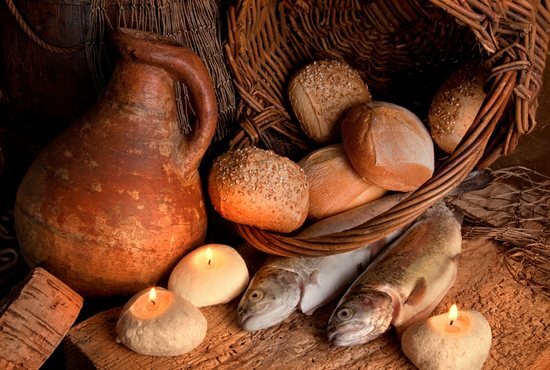 Today we will examine the richly symbolic account of the multiplication of the loaves and fishes found in John 6:1-15, our Gospel reading for July 29, the 17th Sunday in Ordinary Time. There are six accounts of the multiplication of the loaves in the New Testament, five in the Synoptic Gospels (Mk 6:31-44 and Mk 8:1-9; Mt 14:13-21 and Mt 15:29-38; Lk 9:10-17) and one in the Gospel of John (6:1-15). The details of these accounts vary, but most scholars hold that underlying all the accounts is at least one historical event where Jesus performs a miracle (which the Synoptic Gospels call a “work of power”) or a “sign” (as John describes it) involving the transformation of a small amount of food into a feast where all are satisfied, with some food left over. Both Mark and Matthew mention “[green] grass” in the place where the crowd gathers, implying that it is springtime; John goes a step further and identifies the event as taking place as “the Jewish feast of Passover was near.” Just as the Last Supper is associated with the conjoined springtime festivals of Passover (“Pesach”) and Unleavened Bread (“Massoth”), the multiplication of the loaves occurs at the same point in the year. Readers could then connect Jesus’ acts in multiplying the loaves and at the Last Supper with the events commemorated at these festivals, especially God’s intervention drawing the Hebrew people from servitude to Pharaoh to freedom under God. John’s account of who provides the food for the multiplication of the loaves stands in contrast to the Synoptic Gospels’ accounts, both in its content and its vocabulary. Rather than revealing what the disciples themselves have to eat, John’s Gospel reports that a “tiny little boy” (“paidarion,” a double diminutive of “pais,” “son and servant”) has “five barley loaves” (“pente artous krithinous”) — cheaper than wheat bread, barley bread was a usual food of the poor — and “two tiny little fish” (“duo opsaria,” with “opsarion” as a double diminutive of “opson,” originally meaning “cooked food eaten with bread,” here meaning especially “dried or preserved fish”). The narrative notes that this food is enough to feed and satisfy 5,000 men. What may be of the greatest interest, however, are the eucharistic overtones in John’s version of the multiplication of the loaves. The actions recounted in John 6:1-15 parallel the actions recounted at the Last Supper in the Synoptic Gospels and Paul’s account in 1 Corinthians. In each case, Jesus “takes” the food (bread/fish in John; bread/wine in the Last Supper accounts), “gives thanks” (“eucharistein”) or “blesses” (“eulogein”) the food, and “gives” it to the disciples (“didonai”/“diadidonai”). The same actions appear in the deep structure of our Liturgy of the Eucharist: the “taking” of bread and wine in the Preparation and Presentation of the Gifts, the “blessing” of/“thanksgiving” over bread and wine in the Eucharistic Prayer, and the “giving” of consecrated bread and wine in holy Communion. In any case, this deeply symbolic story provides the setting for Jesus’ further teaching on the bread of life in the Sunday Gospel readings from now through the 21st Sunday in Ordinary Time (Year B).